Jeen and I decided to dine in Cova after reading positive reviews here. On a Monday night, it was rather empty with only one table occupied. 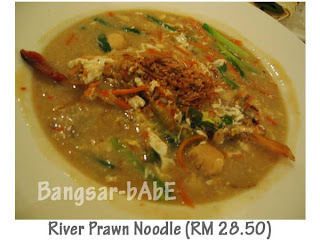 Jeen had the Chunky Mushroom Soup and Panini Paprika Chicken while I ordered the River Prawn Noodles. Jeen enjoyed her mushroom soup immensely. I stole a few sips from her and regretted not ordering a bowl myself. Chunks and chunks of mushrooms (shitake, oyster and button) in creamy velvety broth. I’m drooling as I write this…. I thought her panini was mediocre. While the char-grilled chicken had a smoky flavour, I thought the combo was too dry. The chips however were beautiful. Thickly cut and deep fried till crispy on the outside but oh-so-soft on the inside, it was absolutely lip-smacking with mayonnaise. If only they had aioli…that would have been shiok-ness! Jeen was too full to contemplate dessert so I went ahead and ordered the Banana Caramel Crepe. Served with banana-flavoured gelato on a shell of “cat’s tongue” biscuit, it looked too beautiful to eat. 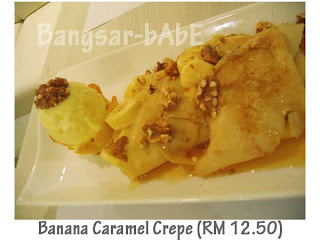 The crepes were topped with sliced bananas, drizzled with rich caramel and sprinkled with crunchy walnuts. I enjoyed every morsel of it! Dinner came up to RM 80.50 including 5% tax and 10% service charge. While the waiters were attentive, the food took a while to arrive. I guess that’s not a bad thing as it shows that everything is made fresh. A bit pricey but the food’s quite good and hopefully it stays that way. Verdict: I love their mushroom soup and dessert. Will come back to try other things on the menu. I’m thinking chocolate lava cake…YUM! 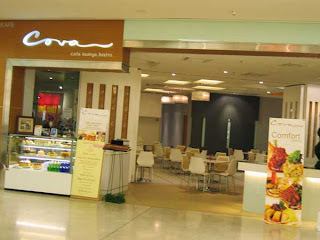 Mei Shum went to Cova with Hanim for coffee & cake (after hearing me sing praises of them). The service was awful. The waiters were lazing around flipping through magazines and not bothered about attending to customers. If she hadn’t called for them, they would not even bother taking her orders. When the waiter came to serve her, HE REEKED of beer and had bloodshot eyes. The coffee was not bad, it came in a nice hearty mug with a chocolate chip cookie. The Toffee Almond & Peanut Butter Cake (RM 13.50) however was in Mei Shum’s words, “WORST THAN SOME CA-PA-LANG CAKEHOUSE”. Especially for the price you pay. The pale-looking peanut butter cream was just plain old whipped cream with a hint of peanut butter. Nothing to shout about. The sponge layer tasted like errrrr…SPONGE. Might as well buy a sponge cake from pasar malam. The only thing nice was the toffee toppings on top of the cake….which you can get from the Tiramisu at Alexis (that taste way way better and cheaper too!). When Mei Shum paid the bill, she gave them RM 100 (her bill was RM 30++) and they came back with RM 12! 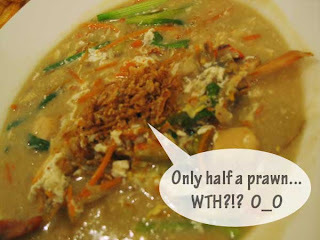 0_0 Be careful…always check the bill and the change given. “This has never happen to me before. I’ve never gotten the wrong change…and there were only 3 other tables occupied in the whole restaurant (shakes head),” says Mei Shum.